Length Of Pull 13.6 in. When it comes to rifle calibers I strongly prefer the .30 caliber as an all-around projectile. 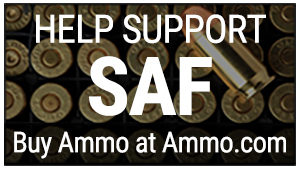 Whether a .30-06 Springfield or .300 Savage there is an ideal bullet for each loading. I am a handloader so the projectile means more than the caliber. The cartridge case simply contains the individual loading. That said if I were to have to rely on factory loads the .308 Winchester would be my favorite. The .308 Winchester was designed to offer performance similar or equal to the .30-06 Springfield in a shorter more efficient case. The .300 Savage had been developed to offer much the same thing–.30-06 performance in a short action. The .308 Winchester, then, is similar to the .300 Savage in many ways but more highly developed and with more energy. 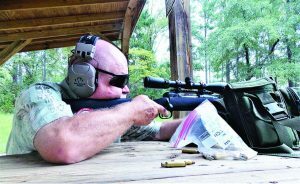 The .308 is a powerful number that is accurate and effective at long range. In the right rifle the cartridge will win a match or take game home. While there are other cartridges that offer impressive performance I am hopelessly tied to the .308. I have not yet exhausted my experiments with the cartridge and own several nice rifles in this caliber. The moderate pressure, good economy, modest recoil and overall good-t- excellent accuracy have endeared the .308 to this shooter. The Savage Model 12 is a good rifle in every way and affordable considering the performance. Savage Arms offers a number of affordable rifles beginning with the impressive Axis II. The Model 12 is a high end rifle in operation and performance. The Model 12 is a formidable rifle that may be called a rifle for shooters rather than hunters. The machining and heat treating of the receiver are a step above that of other Savage bolt action rifles. The bolt is more massive and features opposed locking lugs. Bolt lift is ninety degrees. A feature I particularly like is the oversize bolt handle. The rifle’s bolt and receiver are impressive for those with an eye to quality. The author found the Savage Model 12 very accurate when firing from a benchrest. 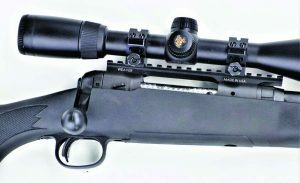 The rifle features a three-position tang-mounted safety. The Model 12 may be loaded and unloaded with the safety on. The integral magazine is rugged and well protected from damage; it is designed for positive feed. Capacity is four .308 Winchester cartridges. The Savage AccuTrigger offers excellent adjustment and a clean, even break free from creep and over travel. I adjusted my trigger to a clean 2.75 pounds. The barrel is forged and then cut and finished from a heavy barrel blank. The result is a stiff barrel that offers excellent accuracy potential. The chamber is precision cut as well. The barrel twist is a 1 in 10 twist in order to handle a wide variety of bullet weights. I have used bullets as light as 150 grains in this rifle but it seems the 168 to 175 grain weights offer the best accuracy. The barrel is 26 inches long. Those familiar with the Savage rifle beginning with the Model 110 know that Savage bolt guns feature a distinctive barrel nut. 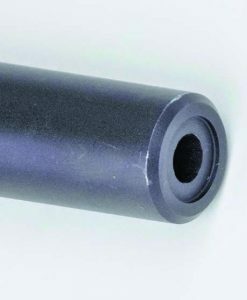 This barrel nut is part of a process that makes a Savage rifle easier to properly assemble than traditional rifles, but which has also led to excellent accuracy potential. The stock is a modern synthetic stock that does the business as well as any and better than most. The stock is thick and offers excellent control from the bench or when firing from the prone position. The rifle weighs 8¼ pounds, which is heavy but not as heavy as some bull barrel guns. The mission is precision! Among the most interesting loads is the Black Hills Ammunition 125-grain load using the Hornady GMX bullet. This monolith bullet is lead free and the construction is a special alloy superior to copper. Fouling is less, velocity is well over 3,000 fps, and accuracy is excellent. This load offers modest recoil for the power and gives the .308 Winchester a leg up in velocity and range. I think it is a great all around .308 loading. I added a Nikon Buckmaster rifle scope. This scope is remarkably affordable yet carries the Nikon name. The field of view is 11.3 to 33.8 feet at 100 yards depending on which of the 3 x 9 magnification settings are used. Eye relief is 3.6 inches. Weight is 13.1 ounces. The overall length is 12.3 inches. 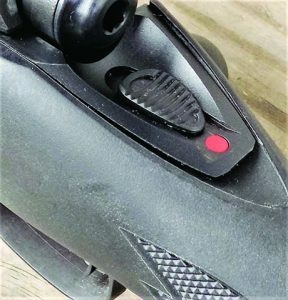 The Buckmaster features tight ¼ inch click adjustments to bring the scope to zero. I set the scope up and bore sighted it, intending to do the final adjustment at the range. I dry fired the rifle at length. I found a smooth action that feeds well. The magazine is a little difficult to load to full capacity but quite easy to load the first three rounds. Most of the groups were fired with three cartridges. The bolt turns ninety degrees to unlock. In testing the trigger action in dry fire the trigger is very crisp with no creep or backlash and a short take-up. The large bolt handle and Weaver type scope mount are good features. This rifle is exceptionally accurate. It should be with the barrel length and care in fitting, but this type of accuracy is uncommon in the price range. As an example the Black Hills Ammunition 175-grain MATCH at 2,817 fps (That is a whopping 3072 foot pounds of energy) has averaged three shot groups of .88 to 1.0 inch from a solid benchrest at 100 yards. 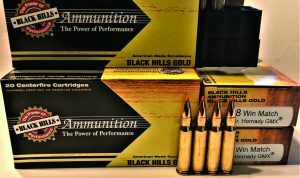 I have also used hunting loads including the Black Hills Ammunition 150-grain SST load with excellent results. I enjoy handloading for its own sake and have worked up a number of accurate loads with this rifle. The sweet spot seems to be 168 to 175 grains at just below maximum, a good place to be. No matter what the cartridge, bullet weight, or overall length the Savage doesn’t like to feed the first cartridge on occasion when the magazine is loaded to four cartridges. I can live with down loading the magazine. A countershrunk muzzle crown is an aid in accuracy. When conducting accuracy testing I fire three shot groups and allow the barrel to cool between shots. This isn’t ‘hunting accuracy’ but I know the accuracy the rifle is capable of. Firing offhand at 100 yards I found the rifle is stable and offers an excellent platform for putting the rounds into the target with real precision. The bolt is smooth and the rifle responds well to a trained marksman. I fired the rifle at both shorter and longer range and against steel plates with excellent results. The Buckmater’s reticle is easy to use to aim under or over to achieve good results. The rifle handles well offhand despite its weight. The wide forend and excellent trigger make for good results. The modern three position safety sets the Model 12 apart from less expensive rifles. As a handloading and gun crank I had many pleasurable hours testing handloads and factory loads in this rifle. As one example the Black Hills Ammunition 125-grain GMX factory load blasted out of the Savage at over 3,000 fps. This is an excellent choice for long range varmint use. Just for curiosity’s sake, I experimented with heavy bullets. For short range use against the heaviest animals, they have merit. The 220-grain Sierra bullet was tested with a .9 inch three-shot group at 100 yards. As might be expected recoil is negligible. As time went on I appreciated the advantage of the three position safety in loading and unloading. The over size bolt handle is a great feature. If I were going to change anything I would like a higher comb on the stock but as issued the rifle is comfortable and a good performer. The Savage Model 12 is a super accurate rifle with much to recommend.